Child Abuse Response and Evaluation Services. 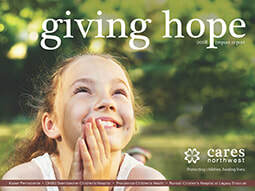 CARES Northwest’s mission is to stop child abuse and neglect through multidisciplinary prevention, medical evaluation, and ongoing treatment in partnership with our community. CARES Northwest is a collaborative, community-based medical program for the assessment, treatment and prevention of child abuse. We provide a safe, child-friendly environment for the assessment of children for whom there are concerns of physical or sexual abuse, neglect and exposure to domestic violence. Physical examinations and interviews are conducted in a comfortable environment to help children feel safe. Founded in 1987, the program is a collaborative effort among four of the region’s leading health systems — Kaiser Permanente, OHSU Doernbecher Children’s Hospital, Providence Children’s Health, and Randall Children’s Hospital at Legacy Emanuel. CARES Northwest was the first program in Oregon to pair physicians and nurse practitioners with child interviewers in a medical setting to provide child abuse evaluations. Coordinating experts in medicine, mental health, child protective services and law enforcement agencies, CARES Northwest ensures that children obtain needed professional services in one child-friendly location. This approach to intervention increases effectiveness, which minimizes trauma to the child, helps prevent future abuse and sets them on the road to healing. CARES Northwest is one of the oldest and largest child abuse assessment centers in the nation, serving more than 5,000 children annually. Approximately 1,500 children are seen at the program each year. We are the only program serving Multnomah and Washington Counties; we also serve children throughout Oregon and Clark County, Washington. What services does CARES provide? At CARES Northwest, children are provided a complete head-to-toe medical check-up. The evaluations are conducted by doctors and nurse practitioners trained in the area of child abuse assessment. CARES Northwest’s high level of expertise leads to more accurate diagnosis of child abuse and neglect. In addition, other childhood diseases or conditions that might be mistaken for abuse or require medical treatment can be confirmed or ruled out. This neutral medical approach helps ensure the right diagnoses and treatment recommendations are made for the health and safety of each child. Why is child abuse an important issue? Upstream solutions. I believe that in order for the child to grow up into a happy healthy young adult he/she deserves immediate care. My goal going into CARES was to be an example of safety, trust, healthy boundaries, and care to every child that comes into the clinic, regardless of their socioeconomic status or circumstances. My educational goals were to learn the importance of emotional space and how to appropriately navigate that space knowing that every child is in a different place. Although my work and success at CARES cannot be quantified, I know I have been successful when I can see the physical changes that take place as a child enters the clinic, withdrawn and anxious, and reluctantly leaves, begging to stay playing games. Students will enhance their capacity to communicate in various ways—writing, graphics, numeracy, and other visual and oral means—to collaborate effectively with others in group work, and to be competent in appropriate communication technologies. Students will explore and analyze identity, power relationships, and social justice in historical contexts and contemporary settings from multiple perspectives. Students will expand their understanding of the impact and value of individuals and their choices on society, both intellectually and socially, through group projects and collaboration in learning communities. Students will learn various modes of inquiry through interdisciplinary curricula—problem-posing, investigating, conceptualizing—in order to become active, self-motivated, and empowered learners. Many people ask me why I want to get into a career that I know ends in burnout. The answer is on the faces of the children at the CARES NW clinic. I remind myself, “you can’t pour from an empty glass” as I continue doing this work. It is of the utmost importance that people doing this work be taken care of by their employer (such providing therapy/health insurance including therapy and paid time off) and take care of themselves (knowing when it’s time to call in a mental health day)...Working with this demographic is sensitive and the effects of bringing any of your own personal business into the space can be catastrophic. Although my time at CARES will come to an end, I will continue to seek out organizations in my community that serve individuals in crisis and learn and be of service to them. I am convinced that I have learned more from my time at CARES than I have given to them, as is true with most places that I have volunteered. I leave knowing more about myself, the career I am working towards, the community around me, and the best ways in which I can help.